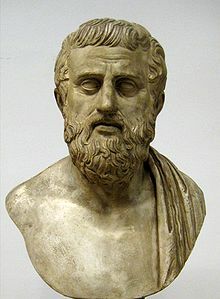 Hi Sophocles(c. 496 BCE-406 BCE) hiya an ikaduha han tulo nga hadto nga Griyego nga traheyano, ngan an iya mga binuhatan waray pa kawawara. Finkel, Raphael. "Adler number: sigma,815". Suda on Line: Byzantine Lexicography. Ginkuhà 2007-03-14. Bowra, C. M. (1940). "Sophocles on His Own Development". American Journal of Philology (The Johns Hopkins University Press) 61 (4): 385–401. JSTOR 291377. doi:10.2307/291377. (nakinahanglan hin subscription (help)). Minghella, Anthony (1987). First episode of BBC's Inspector Morse "The Dead of Jericho". mentioned Sophocles as the "murderer." Seaford, Richard A. S. (2003). "Satyric drama". In Simon Hornblower and Antony Spawforth. The Oxford Classical Dictionary (revised 3rd ed.). Oxford: Oxford University Press. pp. 1361. ISBN 0-19-860641-9. Smith, Philip (1867). "Sophocles". In William Smith. Dictionary of Greek and Roman Biography and Mythology. 3. Boston: Little, Brown, and Company. pp. 865–873. http://ancientlibrary.com/smith-bio/3198.html. Ginkúhà dida han 2007-02-19. Ini nga pakli kataposan nga ginliwat dida han 01:50, 1 Pebrero 2015.